It's the dawn of the 21st century, and George Romero reboots his zombie franchise for modern times with Diary of the Dead. The innovative Romero invented the genre in 1968 with the first film in the franchise, Night of the Living Dead, which commented on the sixties just as Diary comments on current events. 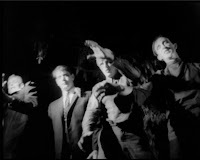 Night of the Living Dead was filmed on a shoestring budget by Romero and his crew, a Pittsburgh advertising production house aspiring to make narrative films. Listening to their commentary on the new 40th Anniversary Edition DVD, it seems like the still-friendly cast and crew had a lot of fun and learned a lot of hard lessons during filming. One of the saddest was the need for proper placement of copyright information. Because of their mistake, the film has been in the public domain for many years. Little did they know that it would be so influential. Films like Signs and 28 Days Later... owe much to Romero's horror movie in their use of setting, pace, and scary monsters. Also attributable to the film's copyright issues are its numerous inferior releases on home video. Well, shop no more. The new edition released by The Weinstein Company and Genius Products puts all others to shame. Released with an all-new transfer and with new special features overseen by Romero, this is as close as you'll get to an "official" release. The highlights are 2 new audio commentaries with cast and crew, as well as a feature-length making-of documentary. Special treat: a seldom heard audio interview with the star of the movie, the late Duane Jones, who rarely acknowledged the film after its release. The film of course led to a whole series of sequels, both official and unofficial. Official: Romero's Dawn of the Dead, Day of the Dead and Land of the Dead. 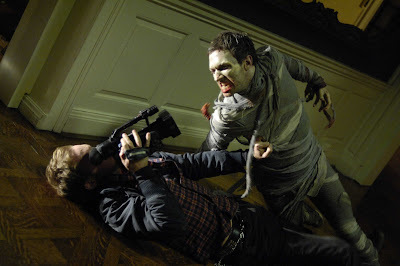 Unofficial: the more humorous Return of the Living Dead series started by John Russo and Dan O'Bannon, and many remakes, including, notably, Zack Snyder's Dawn of the Dead. The unofficial sequels rarely displayed any of the social commentary so prevalent in Romero's films, which attacked such topics as racism, materialism, and class strife. In each of his successive films, Romero's zombies, and the world they inhabited, evolved until in Land of the Dead, the zombies are intelligent enough to strategize in their war against humans, and humans are accustomed to the post-apocalyptic cohabitation with the zombies. There wasn't much of a place left to go for Romero. So he goes back to the beginning with Diary of the Dead, giving the zombies a new lease on life... or death. Following a student film crew caught at the beginning of the zombie apocalypse, but set in modern day, the film gives Romero a chance to comment on some new issues in a fresh new way. Shot entirely in subjective camera, ostensibly by the members of the student film crew -on video cameras, cell phones, and news cameras - there are many instances of poking fun at the cutthroat world of "emerging media" and the blogosphere. The protagonists frequently ask their subjects to restage events since they might have missed them while shooting. Filmmakers will ignore impending doom in order to get reactions from their cohorts. And cut in to the film is footage culled from such real-life tragedies as the Hurricane Katrina aftermath in New Orleans. It is telling that such footage blends in so easily with Romero's film, proving the theme of all his zombie flicks to be correct. It is not the zombies that are the scariest creatures in his films; it is we.